Dog Symbol Celtic Titanium Ring : LOVE2HAVE in the UK! An intricate, laser engraved, flat profile Celtic ring made from titanium with chamfered edging featuring a Celtic engraving of a dog pattern repeated on its outer. It is repeated in panels of up to seven times, depending on the size of the ring ordered. The Celts used animal symbolism to depict true meanings in life. 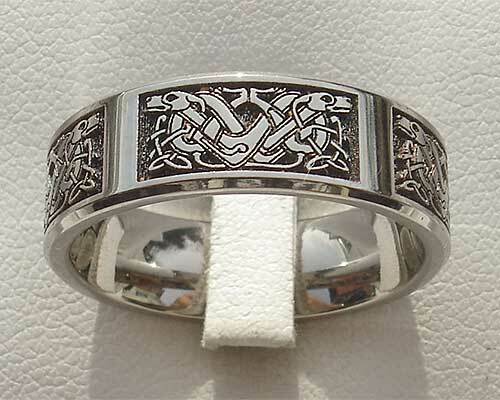 The Celtic animal on this ring is the dog, which still to this day represents faithfulness and companionship. It is also a symbol of good health and luck as the Celts lived with their dogs to hunt for food, so relied on them for everyday life as well as pets. The designer has advised us that the engraving for this ring takes an hour to complete. The engraved surface itself is quite textured, therefore adding to the ancient Celtic symbolism depicted. The ring's width is 7mm and is available in a domed version also on our website.